The many sponsors who contributed to the event's success. West Bend, WI – August 19, 2013 - Courtney Hayden-Fromm had a vision that turned into reality this past weekend at the Washington County Fairgrounds in West Bend, WI. Approximately one hundred horses and riders from Wisconsin, Illinois, even Tennessee and Missouri, came to experience Fromm’s vision of education and competition in one event. “I really wanted a low cost, fun and educational event for riders of all levels to attend and their families to enjoy,” Fromm stated. The weekend event started on Friday with the education portion. Clinician Nancy Whitehead of Woodstock, IL, sharpened up the skills of jumper riders to prepare them for the event. Whitehead is a nationally recognized hunter/jumper trainer and the proud owner of the leading American Bred Sporthorse sire, Roc USA. Whitehead works with some of Roc USA’s offspring, such as Rendezvous 22, who recently placed second in the $75,000 Traders Point Grand Prix in Indiana with rider Nick Novak. Jumper clinician Nancy Whitehead gives pointers to a rider. Brenda Mueller of Oconomowoc, WI gave riders tips on how to ride a hunter derby course as well as a history lesson on how the derbies began, mentioning the USHJA (United States Hunter Jumper Association) International Hunter Derby Finals were taking place in Lexington, KY as well this past weekend. Mueller has been an advocate for educating local level riders sponsoring a series of Chicago Equestrian Hunter Derbies and final for those riders. Brenda Mueller teaches strategy for derby riding to hunter riders. Fromm enlisted the support of many generous sponsors to back the event. Wisconsin Equine Clinic and Hospital, Oconomowoc, WI, was one of the major sponsors of the event. Wisconsin Equine is also an advocate for educating young riders and supporting local events. Friday night finished off with a pizza party sponsored by ChicagoEquestrian.com and a five bar class sponsored by Rising Star Stable of Watertown, WI. A five bar class is like a game of higher and higher. The class was a sure crowd pleaser with Chrissy Hollnagel and her mount Saki taking the blue. An exciting jump off for second with the jumps at 4’6”, left Sara Vogus of Woodstock, IL and Celestina in second place and Robert Nathan of Wauconda, IL with Ariado in third. Winner of the Five Bar class, Chrissy Hollnagel and Saki. Riders then had a chance to try their new skills in a competition. Saturday offered Hunter Derby Classes for all levels. Carrie Buxton of Wellington, Florida and Diane Carney of Hampshire, IL judged the two round event. Carney is one of the forces behind the start up of the hunter derby classes across the nation. She still aids horseman of all levels with hosting and running derbies, course design and supplying derby jumps. She also assisted in the design of the course for this event. The purpose of the hunter derbies is to bring interest back to the sport and increase enthusiasm in owners and riders. Jumps were adjusted to the various heights throughout the day to match rider and horse ability. Riders first jump a course of jumps similar to what you might have seen in foxhunting days with gates, split rail fences and brush jumps. The top 12 scoring horses return for a second round called the handy round, showing how well their horses can turn and gallop a shortened course. The highest scoring horse/rider combination from totaling the scores of both rounds is the winner. The day began with the 2’3” Hall Saddlery Hunter Derby sponsored by Hall Saddlery, Sussex, WI. Winning that class was Abby Hutzler of La Crosse, WI and her horse Cactus. Hutzler rides with trainer Melissa Plemmons at Louise Farm in LaCrosse. Cactus had been shown in some International Derbies before Hutzler purchased him. Now Hutzler, 16, is taking over the reins and was able to clinch the win in her first Derby. Abby Hutzler and Cactus win the 2'3" Hall Saddley Derby. Jude Bauer and Hall Saddlery staff presenting. The next class of the day was the 2’6” Le Cheval Hunter Derby sponsored by Le Cheval Tack Shop of Oconomowoc, WI. Taking the blue ribbon in that derby was Laura Stremke of Naperville, IL and her mount, Fixed Fire. Laura Stremke and Fixed Fire win the 2'6" Le Cheval Derby. Mary Pratt of Le Cheval presenting. 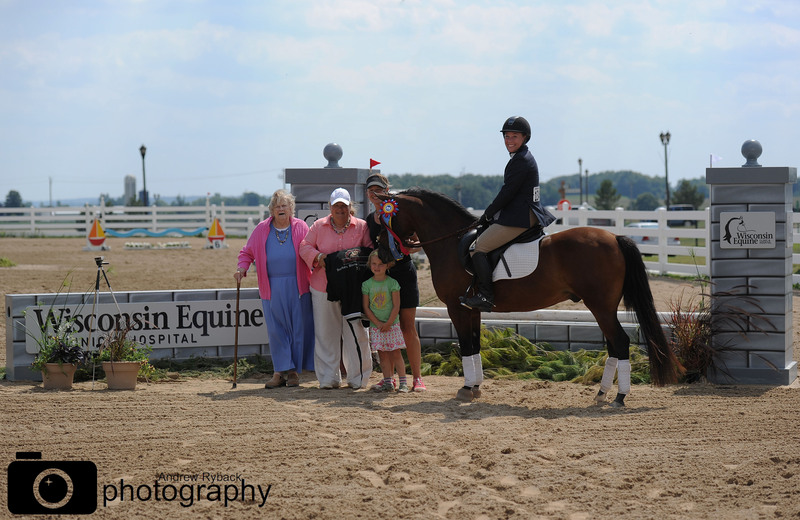 Emily Elek and Stonewall Ponies of Ixonia, WI sponsored the 3’ Lorna Elek Memorial Hunter Derby, in memory of her mother, Lorna, an avid local horseperson. Winning that derby was trainer Melissa Plemmons of La Crosse, WI aboard Marcou. Plemmons was the big winner of the day. In addition to winning the 3’ Derby, Plemmons rode to be the highest scoring horse in first round, winning a grooming box filled with horse supplies donated by Breakaway Farm, Madison, WI. Plemmons was also the highest score in the handy round, winning a silver engraved bowl donated by ChicagoEquestrian.com. Seoul Creek Farm, West Bend, WI, donated a wooden saddle rack for the Overall High Score hunter, which Plemmons and Marcou also took home. Melissa Plemmons and Marcou take the blue in the 3' Lorna Elek Memorial Derby. Emily Elek Presenting. A proud Fromm sponsored the 3’6” Hope Memorial Hunter Derby in memory of her beloved horse. One of Fromm’s students, Maggie Papka, 16, won the derby with her horse Langdon Street. Maggie Papka and Langdon Street take the blue with Courtney Hayden-Fromm presenting. Finishing up Saturday was the 4’ Wisconsin Equine Clinic Mini Prix and exhibitor party. Filled with food and drinks, exhibitors watched the two round Mini Prix as jumpers competed for the fastest time without any jumping penalties. Ten horses took a swing at the course but only four made it without knocking down any jumps. The final four then took their turn at being the fastest on the course. Walking away with win was Paul Yanke, all the way from Tennessee, with his mount Chill Haze. After the presentation, exhibitors could socialize and listen to the band before heading out. Paul Yanke and Chill Haze win the Wisconsin Equine Mini Prix. Dr. Courtney Bolam of Wisconsin Equine presenting. Sunday’s perfect weather only helped to top off a perfect weekend. Four jumper derbies were the main events on the final day. Different from hunters that are judged on form, style and manners, jumpers are judged strictly on time and faults. Derbies for the jumpers are a one round speed class. The fastest around the course without faults or the fewest faults is the winner. Winnng the 3’6” Wisconsin Equine Jumper Derby was Reilly Fardy and Finn. One of Wisconsin Equine’s Veterinarians, Courtney Bolam, rode in the class as well, placing tenth. Fardy rides with Charles Zwicky of Mequon, WI. Tricia Kasten of Wisconsin Equine presents Reilly Fardy and Finn with the top prize. Winning the 3’ Split Rail Stables Jumper Derby, sponsored by the Van Housen Family, Mequon, WI, was Florentino, owned by Northstar Equestrian and ridden by Marybeth Nicolosi of Elm Grove, WI. Florentino with Marybeth Nicolosi take the blue with Courtney Hayden-Fromm and Darin Wenger presenting. Winning the 2’6” North Haven Farm Jumper Derby sponsored by trainer Kelly Novoa of Milwaukee, WI, was Maddy Moeller’s Ima Stellebrity. Kelly Novoa presenting to Maddy Moeller and Ima Stellebrity. Wrapping up the show was the 2’3” Barbara Biever Jumper Derby, sponsored by Helen and Barbara Biever. Barbara Biever was a driving force for the horse business in Wisconsin for many years, acting as horse show mom, horse show secretary, Wisconsin Hunter Jumper Association board member and committee member. Her daughter, Helen, is a trainer in Hartland. Riding to the win was Kerry Ann Johnson-Miljan wih Red Fish Blue Fish. Barbara and Helen Biever presenting to Kerry Ann Johnson-Miljan and Red Fish Blue Fish. Photo by Andrew Ryback. “They say if you do something you love, you never work a day in your life...thank you all for sharing in the love for horse showing,” Fromm concluded. The event will take place next year at the Washington County Fair Park, August 15-17, 2014. For more information, please visit www.oldseoulequestrian.com. All photos by Donovan Mueller for ChicagoEquestrian. Photos may not be used or reproduced without permission.